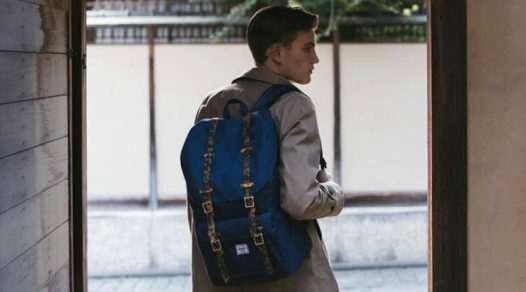 The right ergonomics, portability and functions to meet the demands of frequent travellers. Not every hotel will have a hair dryer, let alone a good one. Many holiday-goers prefer to pack with them a compact and lightweight travel hair dryer when a quick heat dry is essential. Our top 10 best travel hair dryers have the right ergonomics, portability and functions to meet the demands of frequent travellers. 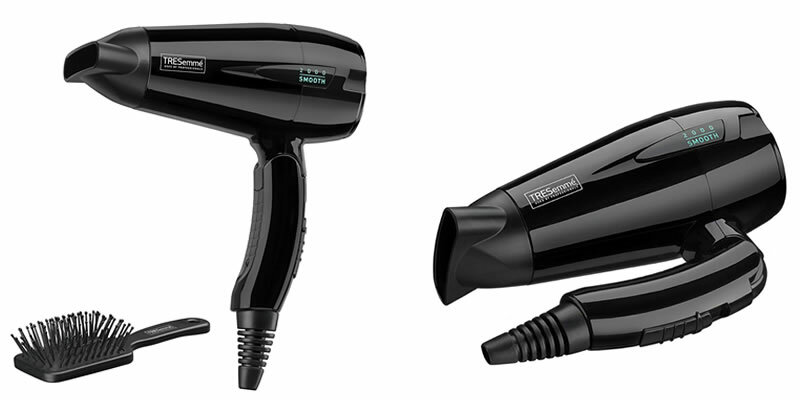 A recognised brand in hairdressing, the Tresemme Fast Dry Travel Hair Dryer is powerful at 2000w without the bulky size. Like a normal hair dryer, it dries hair quick with the same functions of 3 heat settings and a cool shot button. It has a concentrator nozzle to help direct heat towards certain sections of hair for deeper and faster drying. Without a folding handle like most of the best travel hair dryers, it gives a more sturdy feel to the hair dryer. It’s a little quieter than a normal sized hair dryer but the weight is noticeably lighter so it doesn’t weigh your luggage down. 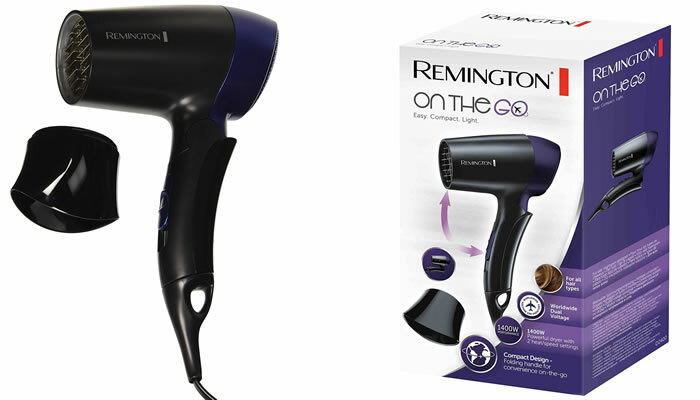 Featuring a foldable handle and removable concentrator nozzle, the Remington Travel Hair Dryer is small enough to fit into pockets within your luggage. The length of the cord is generous at 1.8m and can be used on a worldwide voltage. Although it’s 1400w doesn’t sound as strong as a normal sized hair dryer, it still gives great drying results and the concentrator nozzle helps to achieve that glossy salon finish look. The heat of the hair dryer can be controlled with the two heat settings which is easily accessible on the handle with a flick up or down. 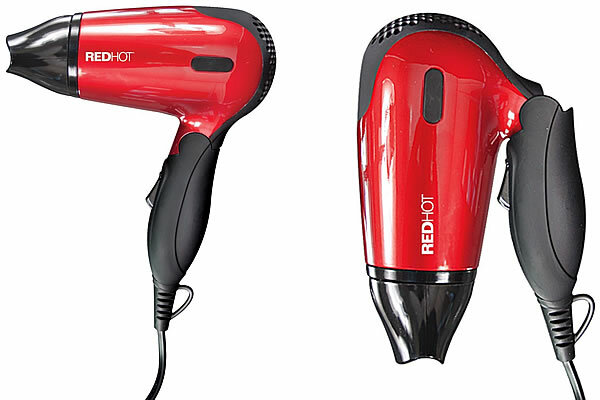 Sturdy and built to a great quality standard, this hair dryer can be used on a daily basis. Standing out from the rest of the travel hair dryers, the Red Hot Benross Travel Hair Dryer is designed with a bright red pop of colour which does not fade over time. With the strong 1200w, the hair dryer dries medium length hair in less than 15 minutes. At the flick of the switch are two heat settings to choose from. This hair dryer handles well and doesn’t get hot to the touch. 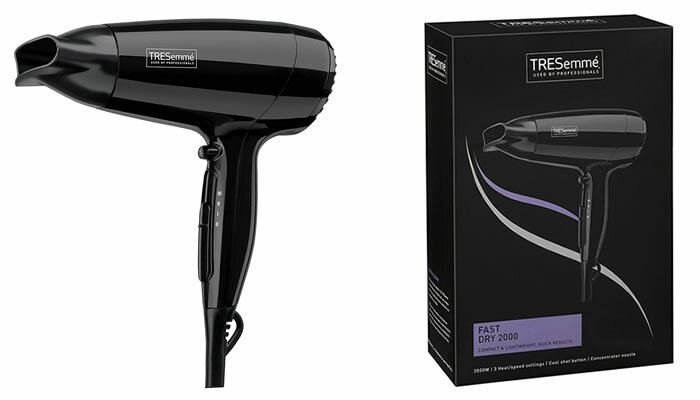 The Tresemme Travel 2000 Dryer provides a salon blow dried hair look with its incorporated tourmaline ceramic technology. This controls frizz and with the use of the included paddle brush, the result is beautiful hair with volume and style. The heat can be controlled with two heat settings and the 2000w power dries hair quickly, regardless of the thickness of your hair. 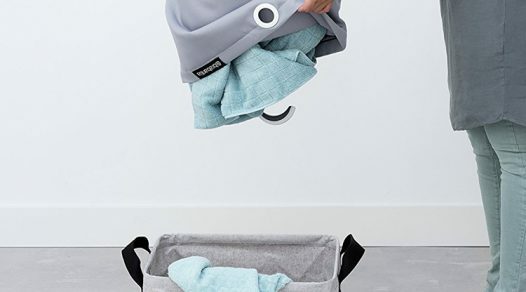 With the foldable handle, it takes up little room in a bag so it’s great for taking with you on short overnight stays. 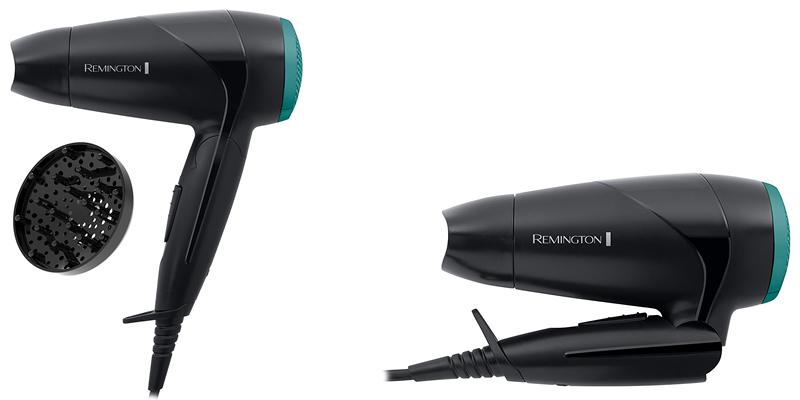 With a promise to deliver super glossy and smooth hair, the Remington Power Dry D3010 does just that with its anti-static ceramic ionic grille. This is built into the concentrator nozzle and like most travel hair dryers with diffusers, this can be detached. Eco friendly lovers will be pleased to see an eco setting – something that many other hair dryers doesn’t have. Using this setting still gives a wonderful blow dried result quickly. Anyone who hates noisy appliances will love how quiet this hair dryer is too. 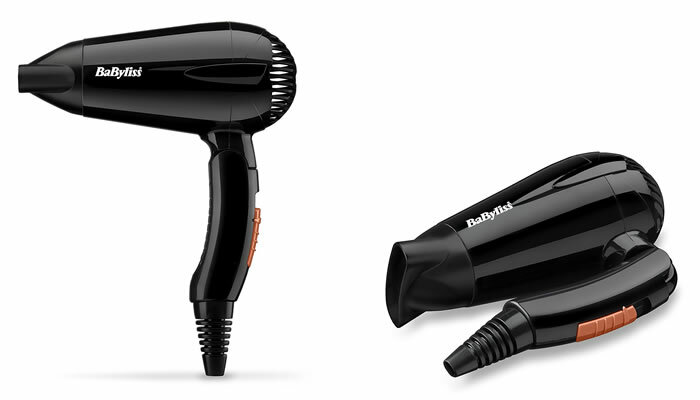 Don’t be fooled by the Babyliss Travel Dry 2000’s small size as it packs a powerful blast of hot air. 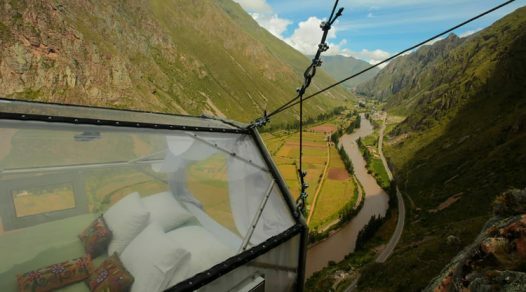 Compared to other travel dryers, the nozzle is more narrow which helps to direct the flow of the hot air better. This gives better results and dries sections of hair faster. There are two heat settings and using the low one is hot enough to dry medium length hair thoroughly without damage. 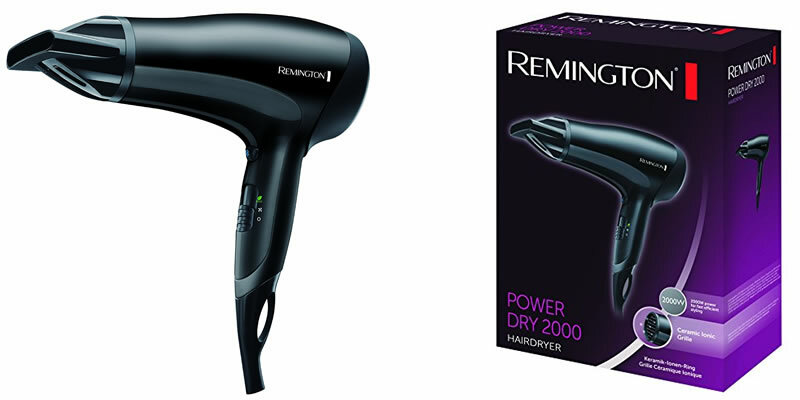 One of the best travel hair dryers with a diffuser is the Remington Travel Hair Dryer due to its lightweight. Operating on two heat settings, the hottest setting can dry long thick hair in under 20 minutes. With the concentrator nozzle, this hair dryer does the intended job easily. 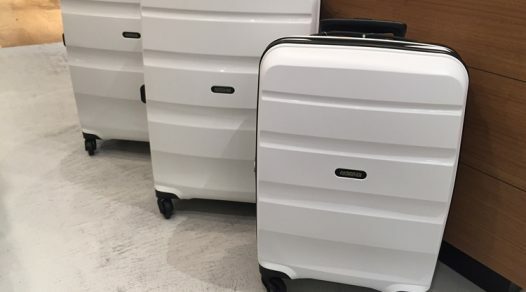 Nothing gets any hotter than the Beurer Style Pro travel dryer with its 1600 watt power. With the combination of the two heat settings and the integrated ionic function, hair is dried to a sleek and shiny finish. 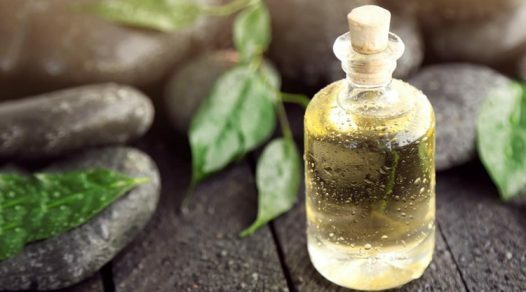 The ions will prevent hair from getting static and maintains your hair’s health. Overheating is prevented with the automatic overheat protection which guarantees the hair dryer will last. The ergonomically designed folding handle is comfortable to hold for a long time to dry long or thick hair. Overall, this hair dryer is built well and feels sturdy. There’s also a five year warranty included. 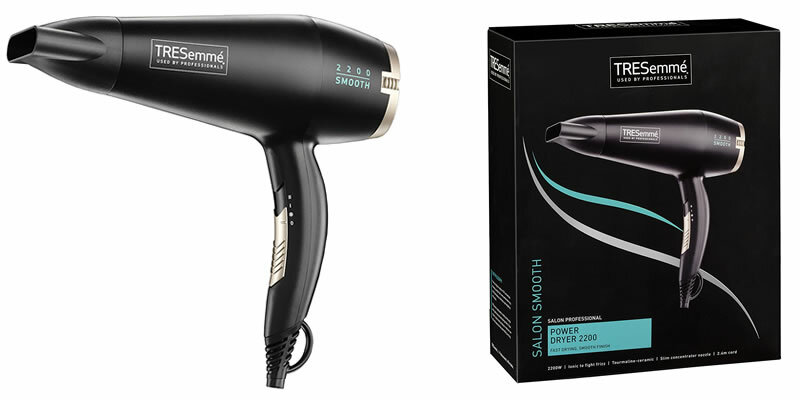 Super powered at 2200 watts, the Tresemme Power Dryer 2200 dries hair in next to no time. At the flick of a switch, you could choose from two heat settings and set your style with a blast of cool air. One of the great features of this hair dryer is the removable rear filter which allows you to clear the dryer from debris and hair. Those prone to frizzy hair will be pleased to see this hair dryer gives a smooth finish thanks to its tourmaline-ceramic and ionic technology. 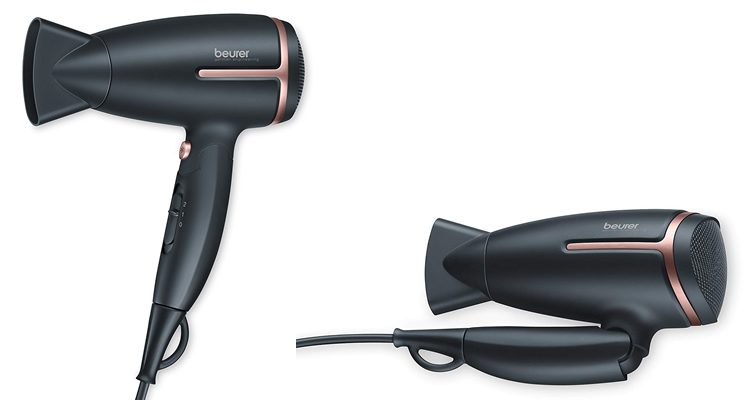 It’s the perfect travel hair dryer to use for hot and humid destinations. 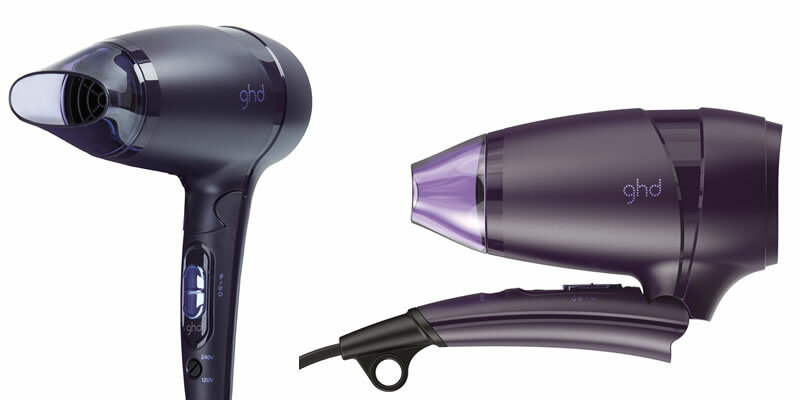 Ghd has impressed us once again with its Flight Nocturne Travel Hair Dryer. Boasting a powerful motor hidden within the black and purple designed lightweight body, the strong airflow can blast hot air up to 65 degrees celsius from the two heat settings. The concentrator nozzle isn’t as narrow as others but it still gives a good direction of airflow. 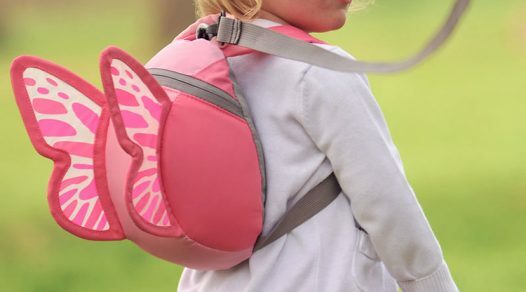 With the extra long cable of 2.4m, users won’t be restricted on where they can dry their hair. Included is a travel case to keep the dryer in to prevent it from damage. 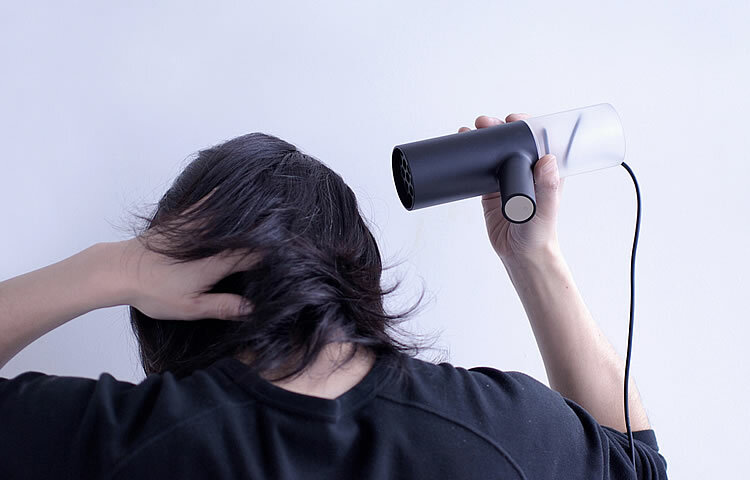 Overall, this hair dryer is impressive with its powerful motor and beautiful in design.